Mercury retrograde strikes again and creates a hot mess for everyone involved! Mercury retrograde is easily the most feared transit in our skies, but it’s also the most common. Happening three to four times a year for about three weeks at a time, Mercury appears to be moving backwards in the sky. The retrograde’s “moonwalk” optical illusion creates quite the stir in technology, travel, and communication. Mercury retrograde is not a time to be feared, but rather a time to slow down, take a second look at everything, think before you speak, and apply the “re” prefix: reflect, reaffirm, realign, rethink, recreate, redesign, etc. It’s easy to remember: “re” for retrograde! If you work with this transit rather than against it, you can truly glean a fresh perspective on your life through reflecting, realigning and recreating (see above “re” prefix). Mercury retrograde is not a time to be feared, but rather a time to slow down, take a second look at everything, and think before you speak. Regardless of how chill you can be during Mercury retrograde, it’s hard to overlook the weird and wacky things that seem to happen to just about everyone . . .
Long-gone exes sliding into DMs (or dreams), phone / computer / technology issues (Instagram and Facebook shut down for hours in the #InstagramBlackout2019), cars breaking down, and miscommunications across the board. 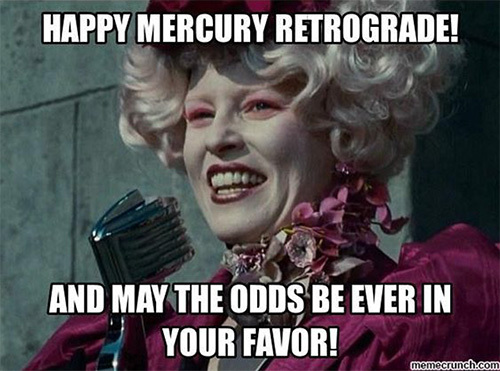 So rather than hide away and blame everything on poor Mercury, have a laugh at some of the most relatable posts and memes that personify the madness that is Mercury retrograde. You are not alone! PUMPING IRONY: A Coalition Of The Confused?